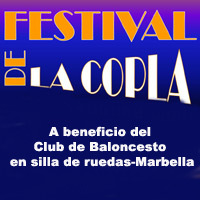 The Festival la Copla 2010 will take place at the Palacio de Ferias y Congresos de Marbella on Friday October 1 at 10:00pm. This festival is in aid of the Wheelchair Basketball Club in Marbella. All funds raised will go to the maintenance of the club activities. This evening is a great opportunity to immerse yourself in Spanish culture, music and dance with artisist such as singer Andrés Bernete, comedian "El Morta", dancer David Aguilera and the singers Leila Jiménez, Tomás Rivera, Sheila Paz, Mari Ángeles Leal and Carmen Navarro", among others. Entrance is 12 euros per person and 10 euros for the handicapped and senior citizens over 65 years old. For more information and tickets call 615 483 473. Or purchase tickets the day of the concert at the Palacio de Congresos box office.